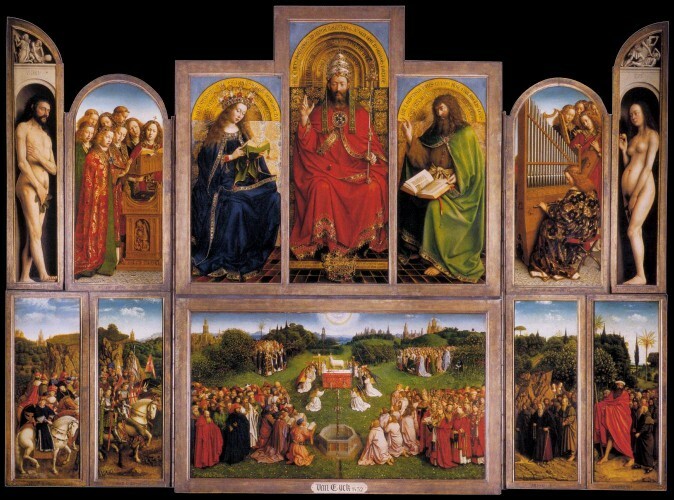 Van Eyck’s Ghent Altarpiece will be subjected to conservation treatment and technical documentation. 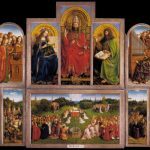 Until November 1, 2010, van Eyck’s renowned Ghent Altarpiece in St. Bavo Cathedral in Ghent will be subjected to an urgent conservation treatment and technical documentation. The last restoration of the polyptych took place in 1950-51, and its conservation for future generations once again requires care and attention. Areas of lifting and tenting paint will be secured, accumulated dust and grime will be removed, and the condition of the paint layers and their panel supports will be examined and documented to determine whether a new full restoration is required in the near future. To allow for the current treatment, the altarpiece will be temporarily dismantled in three stages (the left zone in April/May; the right zone in June/July; and the centre zone in September/October). All activities will take place within the Villa Chapel in St. Bavo Cathedral, the current location of the altarpiece, and can be observed by visitors through a glass wall. The Just Judges panel, the copy by Van der Veken, is currently being conserved at KIK/IRPA in Brussels. The individual panels will be documented with infrared reflectography, under ultraviolet light, and with high-resolution digital macro-photography in visible light and in the infrared. Details from the panels in the left and central zones will be documented with X-radiography, the results of which will be compared with such documents from the 1920s, 1950s and 1980s, to establish whether recent deteriorations can be observed at the craquelure-level. The supports of the four central panels will be analysed with dendrochronology, to complement the already available findings for the panels in the left and right zones. In addition, the central panels will be documented with multispectral scanning and details from these paintings will be examined with non-destructive instrumental analyses. 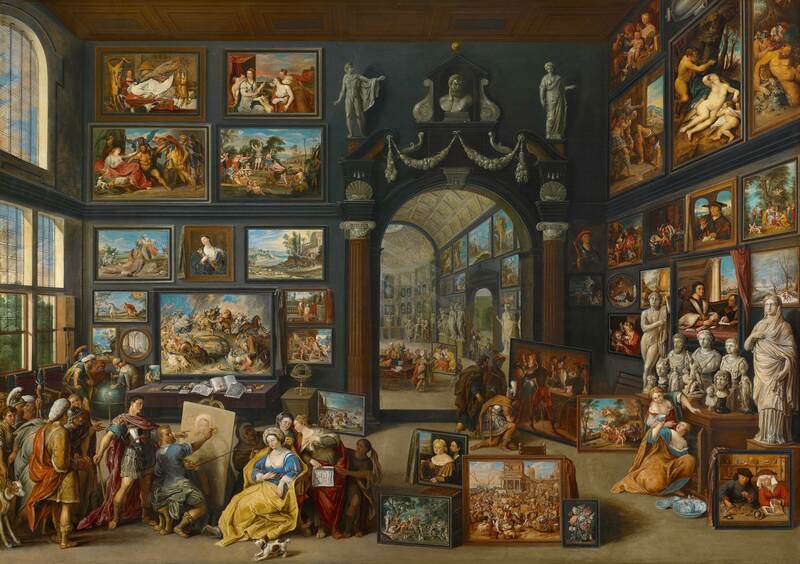 Financial support for the project has been made available by the Flemish Government, the Province of East Flanders, and by the Getty Foundation, in the context of its Panel Paintings Initiative. The Dutch Organisation for Scientific Research NWO provides administrative support in the context of the preparation of the “Science for Arts” programme. Sponsoring in kind is kindly supplied by St. Bavo Cathedral and the Ghent Bishopric; FARO – Vlaams steunpunt voor cultureel erfgoed vzw; KIK/IRPA, Brussels; Royal Museums of Fine Arts of Belgium, Brussels; Amsterdam University; and Ghent University. Other participating institutions are CHARISMA/MOLAB; Klimaatnetwerk Vlaanderen -Nederland; Lukas – Art in Flanders; and Monumentenwacht Oost Vlaanderen. The conservation treatment is directed by Prof. Anne van Grevenstein (University of Amsterdam), and will be executed in collaboration with KIK/IRPA, Brussels and the Royal Museums of Fine Arts of Belgium, Brussels. The technical documentations are coordinated by Prof. Ron Spronk (Queen’s University, Kingston, ON, Canada), and will be executed by KIK/IRPA, Brussels and CHARISMA, among others. The results of the technical documentations will be made available on the Internet through a dedicated website, to be hosted by Lukas – Art in Flanders (under construction). Previous: The Collection Frits Lugt presents a first overview of its print collection in an exhibition organised in honour of Mària van Berge-Gerbaud, who retires beginning of June.